Dimensional flowers attached add flavor and grace to this Cinderella Couture dress. This is a beautiful lace and tulle dress in blush for young ladies. Stunning decorated with 3D flowers and matching pearls. An elegant see thru back. 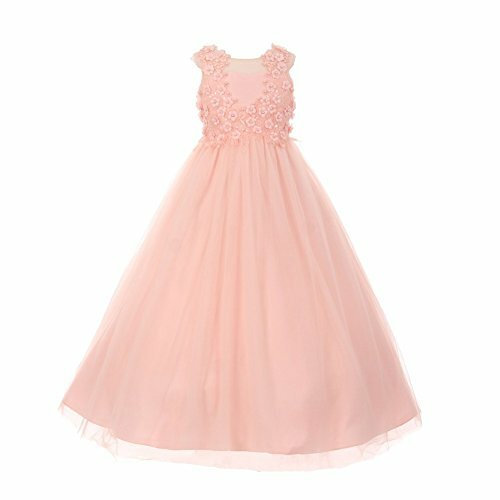 Great for flower girl, graduation, junior bridesmaid, pageant, Communion, spring dress, Easter and special occasions. Floor Length with zipper and crystal button back entry. Illusion A-line dress with see through back, tapered hem, super soft tulle, 3D flower embellishment with pearls and corded lace for a distinctive look. Hanging cover bag included.